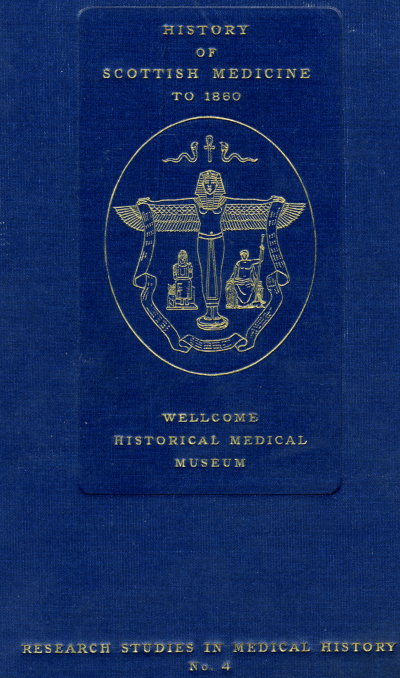 Healing wells - Amulets and charms - Monasteries and medicine - Michael Scot - Gaelic medical manuscripts - Priory of Torphichen - Sir James Sandilands. Soutra-Kirk o' Field-Trinity Hospital - Hospital of Our Lady - Hospitals of St. Mary Magdalen - Hospital of St. Nicholas - Hospital of St. James - Spittal's Hospital - Nether Hospital - St. Thomas's Hospital - Cowane's Hospital - Leper Houses and Hospitals - Early Edicts, etc., regarding Leprosy and Syphilis. Health Regulations in Cities - James IV. and Medical Progress - The Seal of Cause granted to Surgeons and Barbers - Anatomical Books - Acts regulating practice of Surgeons, Barbers, Apothecaries and Surgeon - Apothecaries. First Scottish Military Surgeons - Steel Hand of Clephane - Action against unlawful practice - Medico-legal cases - Early Specialists in Surgery - Medical Officers, public and private - Jerome Cardan - Robert Auchmowtie. Early Regulations, 1498 - Notification made compulsory - Convictions - Isolation - Cleansing infected clothing and houses - Buriers of the dead - Charities for plague-stricken poor - Appointment of a Medical Officer - Recurrences in the XVIth Century - Immunity in Aberdeenshire, Sutherlandshire and Liddesdale. Advance of the Guild of Surgeons and Barbers - Surgeon-Apothecaries Royal College of Surgeons of Edinburgh incorporated - Double and Triple qualification - Instruction in Anatomy - Convening House built New Surgeons' Hall - Pitcairne and Monteath - Eliot, first "Professor of Anatomy" - The Monros. Impediments to progress Anderson's Scots Pills - Professional fees - Military Surgeon's emoluments - Richard Wiseman, "the father of English surgery" - The new cure of fevers - Pharmacopoeia issued by the Royal College of Physicians, Edinburgh - Animal substances introduced - Irregular practice by mountebanks - Medical literature - Smallpox epidemics - Inoculation adopted in Scotland - Sibbens and croup - Account-book of Dr. William Cullen - The whey cure - Description of an 18th century Scottish country practitioner. 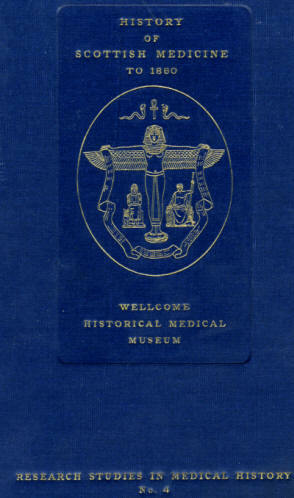 First Scottish Voluntary Hospital - Royal Infirmary of Edinburgh - Payment of hospital staff - Clinical lectures - First children's hospital - Institutions for sick poor - Town's Hospital and Glasgow Royal Infirmary - Aberdeen Royal Infirmary - Dumfries Infirmary - Montrose, Dundee, Paisley, Inverness, Greenock, Perth and Stirling Infirmaries - Asylums for the insane. Foundation - "Mediciners" at King's College - Diploma of M.D. degree - Medical Officer of the Burgh - Skeen's treatise on the plague - The Gregorys - Marischal College - Lecturers on medicine - "Burning of the burking-house" - Aberdeen Medical Society - The University of Aberdeen. Salaried Medical Officers - Peter Lowe - Faculty of Physicians and Surgeons - Code of rules - Prosecution of quacks - Medical library formed - William Cullen and Joseph Black. First Scottish University - Early Medical teaching - John Knox - Chair of Medicine and Anatomy - The Chandos Chair - Medical School. 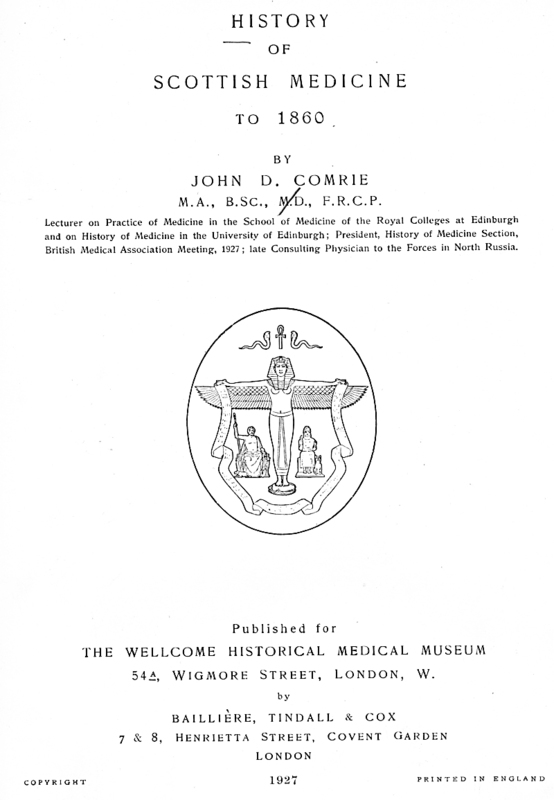 Early Efforts - Botany and Anatomy - Early Physic Gardens - Archibald Pitcairne - Professors of Medicine in Town's College - Robert Sibbald - Travelling doctors and mountebanks - Medical Faculty of Edinburgh University - Plummer and Rutherford - Professor of Midwifery - Requirements for degree of M.D. 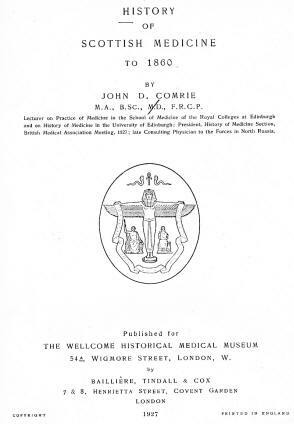 Effect of the Rebellion - Whytt's researches - Monro's foramen - Cullen's work and text-books - The "Brunonian Theory" - Black discovers carbon dioxide - Progress of Edinburgh Medical School - Monro's lectures - Bell's "System of Surgery" - Royal Medical Society of Edinburgh. Glasgow Royal Infirmary - C.M. Glasgow - Progress of Medical School - Hunter's Museum - The Andersonian College - The Medico-Chirurgical Society - The Botanic Garden - Professorships of Midwifery and Surgery - Joseph Lister Chair of Chemistry - First laboratory devoted to chemical research - The Anatomy Act - Allen Thomson - Chairs founded by Queen Victoria - Easton's Syrup - List of Teachers in the Medical School of Glasgow. Gregory's Powder - Medical litigants - Public Lunatic Asylum opened - Development of Chemistry - Professorship of Military Surgery - University Chair of Systematic Surgery - Chair of Clinical Surgery - Edinburgh Medical and Surgical Journal - Extra-academical Teachers of Anatomy - John and Charles Bell - Anatomical Publications - Anatomical Museum - Knox and the Resurrectionists - Anatomy Act, 1830 - Cellular doctrines. Chair of Medical Jurisprudence - Materia Medica - Discovery of Conine - Chair of Surgery - Fergusson - Lizars: "Observations on Extraction of Diseased Ovaria" - Liston: "Observations on Amputation" - James Syme - Joseph Lister - James Young Simpson - Chloroform - Chair of Pathology - John Hughes Bennett - Chair of Chemistry - Isolation of "Morphium" - Original hypodermic syringe - Chair of Medicine - Public Health - Midwifery and Diseases of Children. Position up to 1858 - The Medical Act - Improvement of Scottish Universities.